Chambal river is one of the cleanest perennial rivers of India. It originates at Janapav, south of Mhow town, on the south slope of the Vindhya Range in Madhya Pradesh. Chambal flows north-northeast through Madhya Pradesh, running for a time through Rajasthan, then forming the boundary between Rajasthan and Madhya Pradesh before turning southeast to join the Yamuna in Uttar Pradesh. It ends a confluence of five rivers, including the Chambal, Kwari, Yamuna, Sind, Pahuj, at Pachnada near Bhareh in Uttar Pradesh state, at the border of Bhind and Etawah districts. Ancient name of Chambal is said to be Charmanyavati, which may be in reference to the story of king Rantideva sacrificing several cows on its banks. In the epic Mahabarat, Charmanwati was the southern boundary of Panchala Kingdom. King Drupada ruled the southern Panchalas up to the bank of the Charmanwati river. The region was part of the kingdom of Shakuni, the maternal uncle of Kauravs. After her attempted disrobing at the hands of Kauravs, Draupadi cursed anybody who will drink water from the river. The infamy gathered by the river may have been the reason for absence of any big settlement on its banks except Kota. Keshoraipattan near Kota is a famous pilgrimage spot dedicated to Lord Vishnu on banks of Chambal. 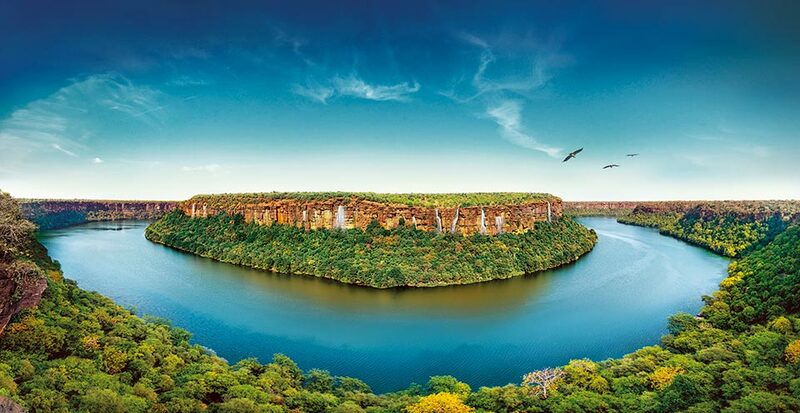 Chambal River originates from northern slopes of Singar Chouri peak, at an altitude of 884.4 m, in the Vindyan Range. It flows in northerly direction through Madhya Pradesh (M.P.) for about 346 kilometres and enters Rajasthan near Chaurasigarh (Chittorgarh). Here the river falls 505 m and then enters a gorge for 113 Kms and leaves it near Kota. From Kota, it makes boundary between Kota and Bundi district and then boundary between Rajasthan and M.P passing through Sawai Madhopur, Karauli and Dholpur. It eventually enters U.P. and flows for about 32 kilometres before joining the Yamuna near Bhareh. Kota, Baran and Dholpur districts. On its south, east and west, the basin is bounded by the Vindhyan mountain ranges and on the north-west by the Aravallis. The proposed Parwati- Kalisindh-Chambal link is one of the big projects being planned in the basin which will divert surplus waters of Parwati and Kalsindh to the Rana Pratap Sagar or Gandhi Sagar dam. 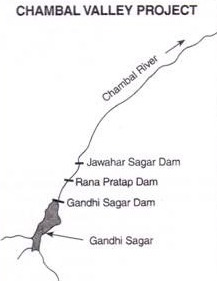 The tributaries of the Chambal include Shipra, Choti Kalisindh, Sivanna, Retam, Ansar, Kalisindh, Banas, Parbati, Seep, Kuwari, Kuno, Alnia, Mej, Chakan, Parwati, Chamla, Gambhir, Lakhunder, Khan, Bangeri, Kedel and Teelar. Bagli (District Dewas) in Madhya Pradesh. Enters Rajasthan at Binda Village. Chambal, Nonera village in Baran district in Rajasthan. Parban River is a tributary of Kali Sindh. that originates in Sehore district of Madhya Pradesh. 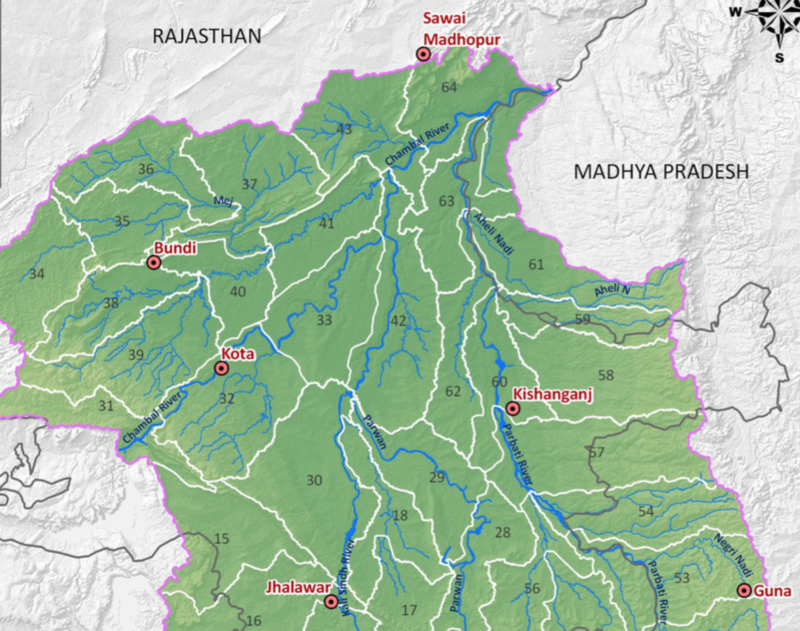 Parban flows through Sehore, Shajapur and Rajgarh districts in Madhya Pradesh . It covers Jhalawar, Kota, Baran districts of Rajasthan and meets Kali Sindh in Baran district of Rajasthan. Mej river is a left bank tributary of Chambal River. It originates near Mandalgarh in Bhilwara and joins Chambal in Kota. 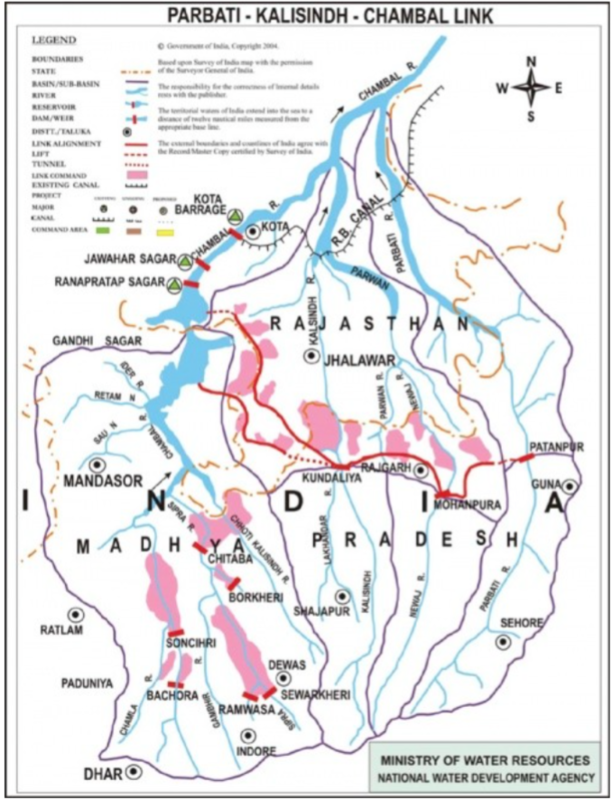 The catchment area of Mej river extends over Bhilwara, Bundi and Tonk of Rajasthan.